Combine art, architecture, and Roman cuisine on a 4.5-hour private tour of the Vatican Museums and Campo de’ Fiori, a historic, open-air market. 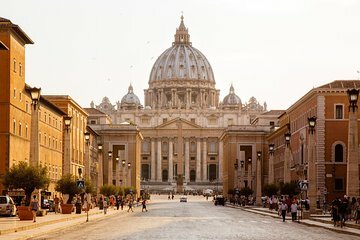 You’ll have skip-the-line tickets and a personal guide as you explore art galleries, the Sistine Chapel, and St. Peter’s Basilica, with plenty of time to see the things that interest you most. At Campo de’ Fiori, taste your way through a selection of market-fresh treats including pizza, cheeses, and oils. This 4.5-hour tour includes entrance fees and tastings, and can accommodate your group of up to six people. Meet a guide at the Vatican Museums, where you’ll skip the line and enter the museum before the doors open to the general public. With a private group, you’ll have the flexibility to go straight to the highlights of the Vatican, ask questions, and learn about the fascinating history of Vatican City. You’ll pass through galleries of art, sculptures, and other artifacts on your way to the magnificent Sistine Chapel, where Michelangelo’s vivid frescoes cover the high walls and arched ceiling. Enter St. Peter’s Basilica through an interior passageway, then see the design and art that's housed in the remarkable Catholic shrine. From St. Peter’s Basilica, cross St. Peter’s Square, an enormous plaza designed by Bernini, with an Egyptian obelisk at the center. Grab a taxi for the short trip to Campo de’ Fiori (taxi own expense, roughly EUR 10), where your local guide knows all the best things to try. Taste your way through some classic Roman foods, including crispy pizza bread, cold-cuts, cheeses, oils, and vinegar, learning about Roman food traditions as you walk. This tour concludes at the Campo de’ Fiori, close to attractions and public transport in central Rome.